Coffee roasting is the process of turning green coffee beans into consumable coffee beans. By controlling variables such as temperature and time, different flavors can be developed from the coffee bean. Despite its very scientific nature, coffee roasting is as much an art as it is science. Each roaster creating their own unique flavor by utilizing different techniques and methodology, making coffee roasting one of the most important steps in coffee production. All coffee connoisseurs know, fresh coffee is the best coffee. It is widely considered that coffee is best enjoyed within three weeks from the roasting date. The roasted coffee bean develops and changes flavors during this three week period showcasing different spectrum of notes and mouthfeel. After this period of time, coffee slowly loses its more refined flavors and slowly become stale. By roasting your own coffee beans, you fully control the freshness of your coffee. Unlike store bought coffee which may have been on the shelves for weeks if not months, the coffee you roast will always be fresh. Even if you are lucky enough to be able to shop directly from coffee roasters, roasting your coffee will cut out the delivery time which almost always makes self-roasted coffee the freshest coffee. Because of this, you will also be able to enjoy the development and evolution of the coffee flavor for each coffee bean from the very start. One of the element that makes coffee so interesting is the different flavors different roast can bring out of the same coffee bean. A darker roast will bring out the sweetness and bitterness side of coffee while a lighter roast would create a fruitier and more acidic flavor. So even for the same exact coffee bean, if the roast is light, one can taste fruitier notes such as citrus and berries; while if the roast is darker, one may taste chocolate, molasses, or caramel. Unfortunately, it is difficult to find different a roastery which would roast the same coffee bean differently. Therefore, the best way to discover the full flavor profile of a single coffee bean is to roast it yourself. The art of roasting coffee is to not only make it consumable, but is the art of balancing and exploring these different flavors within the coffee itself. When you roast your own coffee, you can control the darkness of the roast that best suits your personal taste and brewing method. Even though the traditional espresso roast is a very dark roast, you can try a lighter espresso roast for natural processed African bean which can be very fruity and bright. Alternatively, a darker than normal Sumatra for drip coffee can create a nice balance of orange and chocolate notes. Playing around with the darkness of roast for different coffee can lead to some pleasantly surprising results. Each roaster has its signature flavor and style. Tim Wendelboe is famous for his clean, crisp, and bright coffee. Arabica in Japan has a dark molasses sweetness in most of their coffee. Stumptown, Bluebottle, Intelligentsia, and all other roaster each have their own signature style. By exploring and continuously roasting, you can create a style that is distinct and uniquely yours. You will find that there is a certain motif that carries through all the beans you roast. You can then refine this by exploring why and how you created this flavor. By controlling factors such as temperature rise and airflow you can manipulate how the flavors develop in the coffee beans. You can control the mouthfeel of the coffee by controlling the speed of the roast. A slower roast creates a denser coffee with more crema, suitable for brewing espresso. A faster roast creates a brighter and more “tea-like” coffee, most suitable for showcasing some of the finer flavors in coffee. The airflow will control the cleanliness of the cup. Increasing airflow creates a cleaner and lighter cup, while decreasing airflow creates a bolder sometimes smokier coffee. There are many other technique and habits each roaster utilize which create their own unique style. It is often the small details which makes each roaster different and unique. 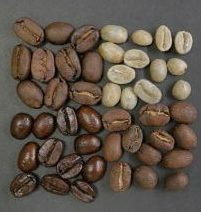 Unlike roasted coffee beans which should best be enjoyed within three weeks, green unroasted coffee beans can be stored for two to three years under the right conditions. This means that you can create a library of green coffee beans that can you like and enjoy them even when the particular variety is out of season. Starting a collection of coffee beans also allows you to compare coffee beans from the same estate from different years,similar to how a sommelier would enjoy bottle of wine from the same winery from different vintage. The reason for this is to further explore the concept of terroir. By drinking coffee from different years, you compare changes in weather and see how they affect coffee flavors, further expanding your coffee knowledge. The best part about creating something is sharing it with people. So the most exciting part after roasting a batch of coffee, is brewing it and sharing it with family and friends. Ask for their feedback, because this feedback can be used to improve the next roast, which can then be shared again creating a cycle to refine your roasting technique. The coffee you roast makes for a perfect gift for special occasions. And after you perfected different roasting techniques you can even create blends for different people. Perhaps even one day sell your own roasted beans as a business. Coffee roasting is a complex but very interesting process. Understanding the science while perfecting the art of roasting will help you enjoy the most important step to coffee making.